What mechanisms allow populations and species to persist in a changing climate? In order for populations and species to persist in a changing climate (as opposed to go extinct, either locally or globally), they need to have adequate coping mechanisms. These can include mechanisms of tolerance, acclimation, adaptation, and re-distribution. For example, we have used physiological experiments to assess spatial variation in climatic tolerances of marine invertebrates (Sorte et al. 2011, Zerebecki & Sorte 2011). This space-for-time approach gives us an idea of whether acclimation and adaptation could allow population persistence as the climate changes. When physiological mechanisms aren’t enough to allow population persistence, then populations must move to track encroaching temperature isoclines. We have been focusing on whether sessile invertebrates with dispersive larvae can shift their ranges poleward where dominant currents flow equatorward, including the California Current in the northeast Pacific and Labrador Current in the Gulf of Maine. 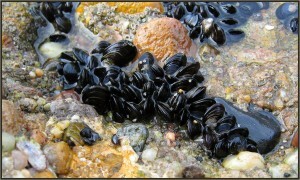 We collaborated with the Davis Lab at UCI to integrate modeling and field observations to show that California mussels likely disperse northward despite prevailing currents along the US west coast and that their thermal tolerances reflect temperatures experienced by pelagic larvae (Sorte et al. 2018). Work funded by MIT Massachusetts Sea Grant (2013-16, with co-PIs Robyn Hannigan, and Ron Etter of UMass-Boston) used historical, observational, and geochemistry approaches to show that blue mussels are declining in the Gulf of Maine (Sorte et al. 2017) and patterns of population connectivity could be important in persistence of this important foundation species (Sorte et al. 2013).